Sikkens is the premium brand of AkzoNobel, one of the world’s leading suppliers of paints and services for vehicle repair. All Sikkens products are designed to make every job as simple as possible, including waterborne and solvent based products. A multi-generational upgrade to the popular ACLV featuring State-of-the-art polyurethane high solids, HAPS compliant and low VOC system specifically designed for CV Builders and Fleet R&R Shops. 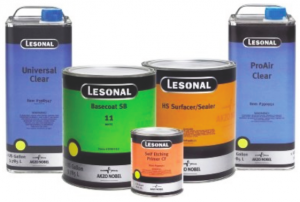 Reliable, renowned for its superb color accuracy and ease-of-use, Lesonal is a true value-for-money, fully compliant refinish paint system. The U-Tech line has a complete assortment of products that are VOC compliant for the fleet coatings market. This includes commercial vehicles, buses, tractors and light industrial equipment that uses products derived from car refinishes paint technology. One Mixing System does it all! Wanda products are durable, simple-to-use and require fewer components to complete the job. Great value without sacrificing quality, that’s why Wanda is the Smart Look and Smart Choice.